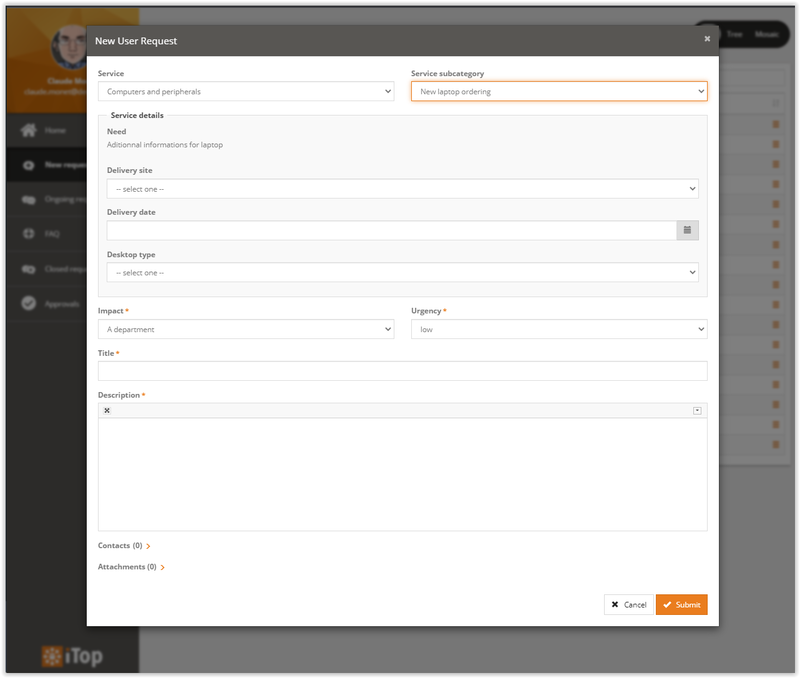 Define personalized request forms based on the service catalog. Add extra fields for a given type of request. 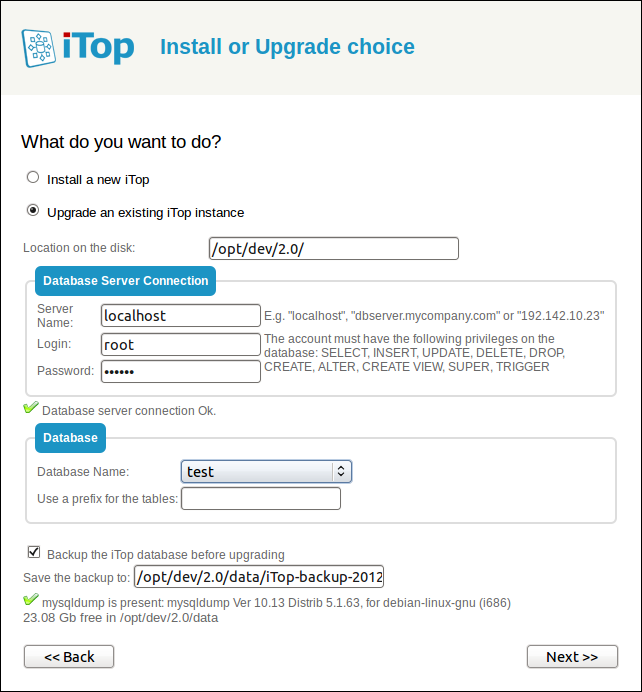 Compatibility issue: for iTop version lower than 2.4.0, there is a special installation/upgrade process. This module provides the capability to add additional fields (depending on the selected Service / Service subcategory) for a User Request in order to better qualify it. For instance define the number of CPUs, the quantity of RAM and the type of OS when a user asks for creating a new virtual machine. A request template is related to a service subcategory. 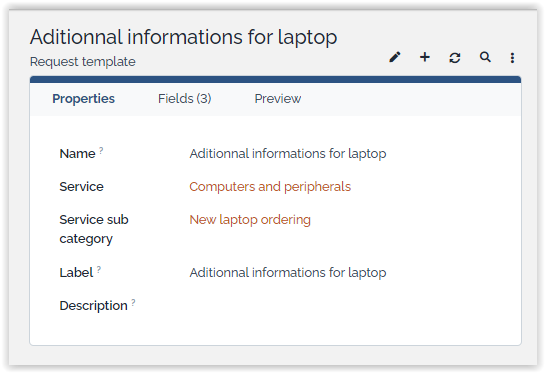 You just have to define your templates: when a user creates a ticket, the additional fields will appear in the ticket edition form, depending on the selected service subcategory. 2018-01-26 2.0.10 Ticket fields can now be used in customized forms. - N°1080 When a field aims at selecting an object, the email body shows the id of the selected object. 2016-11-29 2.0.4 Implemented placeholders (e.g. $this→html(service_details)$. Requires iTop > 2.3.1 for the placeholders to work fine. 2016-09-08 2.0.3 Added validation pattern to Date and DateTime fields. Fixed a PHP Warning when launching the cron manually. 2015-11-26 1.0.5 Fix for crash when submitting a ticket from the portal for a template with an ENUM field containing some special characters. 2015-09-29 1.0.4 Fix for a crash when a “drop-down list” field contains some weird characters (accents, question marks…) at the beginning of the list of values. 2014-12-10 1.0.3 Cosmetics on the module name. 2014-04-03 1.0.2 Minor fix to allow non admin users to import Template fields in CSV. 2014-03-10 1.0.1 Bug fix for template fields with the same name as an attribute of the object. 2014-02-05 1.0.0 First version, never validated. The placeholders will not work with iTop 2.3.1 and older. 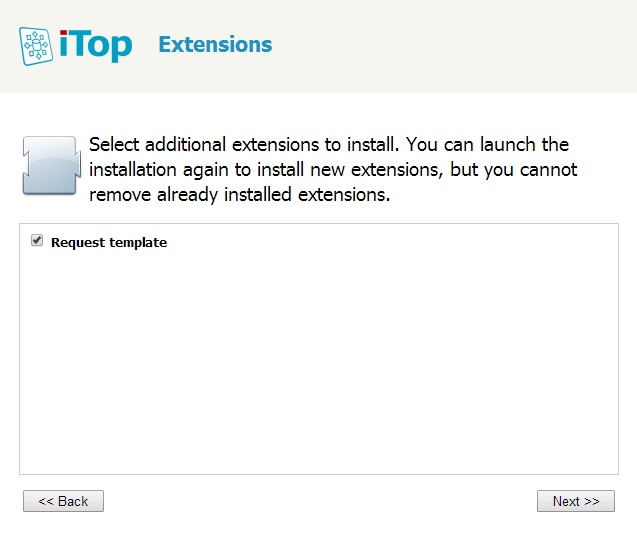 Download the package and expand its content into the “extensions” directory of iTop. If you have already installed iTop, make sure that the configuration file config-itop in conf/production is NOT read-only. Finally check the module “Request template” in the list of extensions at the end of the interactive wizard. Then complete the installation. 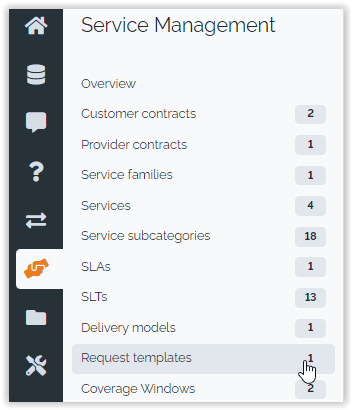 A request template is identified by its name the related service and service sub category. The label is used on the portal to select a template if several are defined for a given service sub category. If a end-user selects a service sub-category on the customer portal which is related to a request template, the specific fields for this template are displayed, grouped under the denomination Service details. In a notification template, or anywhere else where a template can be used, the following placeholders will be available. $this->service_details$: a plain text representation of the selected values. This is suitable for a plain text email. Though it seems possible to use it within an HTML document, by using a PRE tag, this is NOT recommended because HTML entities (like <) still need to be escaped. $this->html(service_details)$: an HTML representation of the selected values. Hidden fields are forcibly excluded from the placeholders. When a template value corresponds to an object selected into iTop, the returned value will be the friendly name of the object.